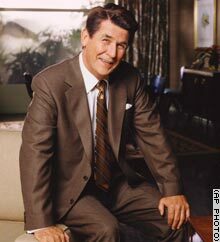 Actor James Brolin as President Ronald Reagan poses on the set of CBS' "The Reagans. WASHINGTON (CNN) -- The Republican National Committee Friday asked CBS to allow a team of historians and friends of former President Ronald Reagan and his wife to review a miniseries about the couple before it airs. Republicans have expressed concern that the miniseries, titled "The Reagans," may inaccurately portray the couple. In a conference call with reporters, RNC Chairman Ed Gillespie said he sent the request to CBS Television President Leslie Moonves. Gillespie said that if CBS denies the request, he will ask the network to run a note across the bottom of the screen every 10 minutes during the program's presentation informing viewers that the miniseries is not accurate. CBS spokeswoman Dana McClintock said Moonves received the letter, but neither he nor CBS had any comment on it or the miniseries. Gillespie said that if CBS rejects both requests, the RNC would to sell tapes and DVDs on its Web site that would present "the real Reagan record." "It's not the kind of thing we'll make money on -- I'm trying not to lose money on it," Gillespie said. "I want to publicize Reagan's record." Gillespie added that print and TV ads are being prepared to rebut the miniseries and that Republicans may try to buy time to run the ads during the miniseries. While Gillespie -- who acknowledged that he has not seen "The Reagans" and has formed his opinion of it based solely on news reports -- had a number of complaints, he said he was most concerned about a comment attributed to Reagan in one episode. There is no evidence that the president told his wife during a conversation about AIDS patients, "They that live in sin shall die in sin," Gillespie said. The author of the screenplay, Elizabeth Egloff, has acknowledged that there is no evidence Reagan ever uttered those words, but she told the New York Times that "we know he ducked the issue over and over again, and we know she was the one who got him to deal with that." The miniseries is scheduled to air November 16 and 18.